Having lived in Asia for 6 years of my life, I am pretty immune to noise by now. I can sleep through the loudest thunderstorm, I like hearing early morning church bells or the Call to Prayer, and I barely even notice street noise – no matter how bad others think it is. One of my favourite memories of India is lying in bed listening to frantic festival drumming and firecrackers exploding into the night sky. 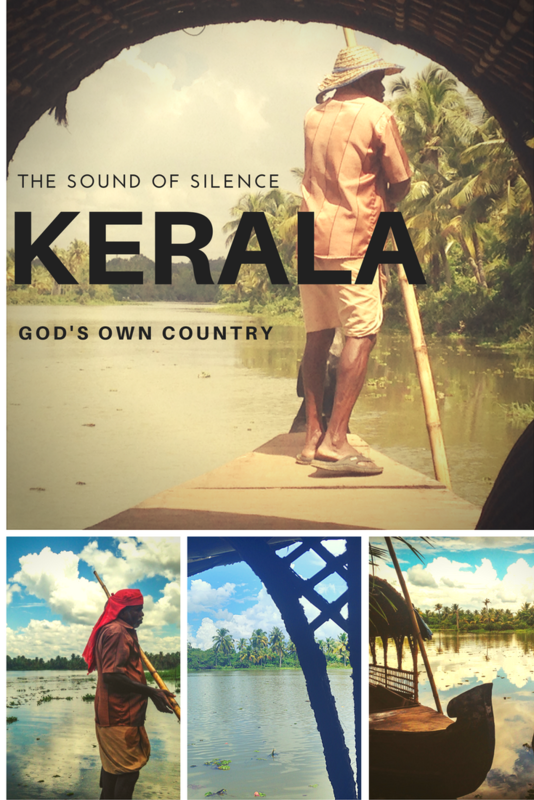 But every now and then the sound of silence is good for your soul, which, when you live in India, is why you go to Kerala. 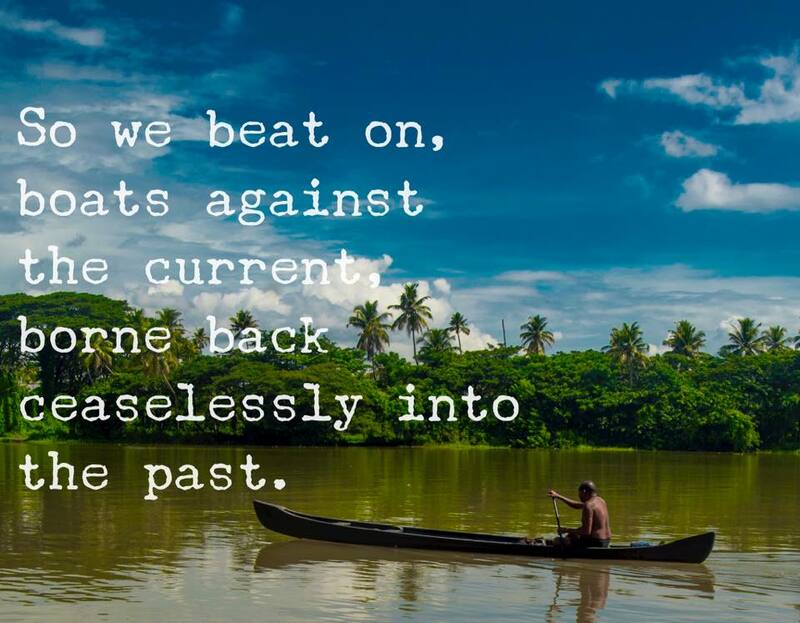 Dipping the oar (a long bamboo stick) rhythmically in and out of the water, our guide – dressed for the climate in lungi, salmon shirt and headscarf – expertly steered away from the banks where we had embarked. With each stroke through the water the buzz and groan of traffic receded, until at last, nothing. Even our excitable conversations slowly ebbed to the pulse of the river’s soothing flow. 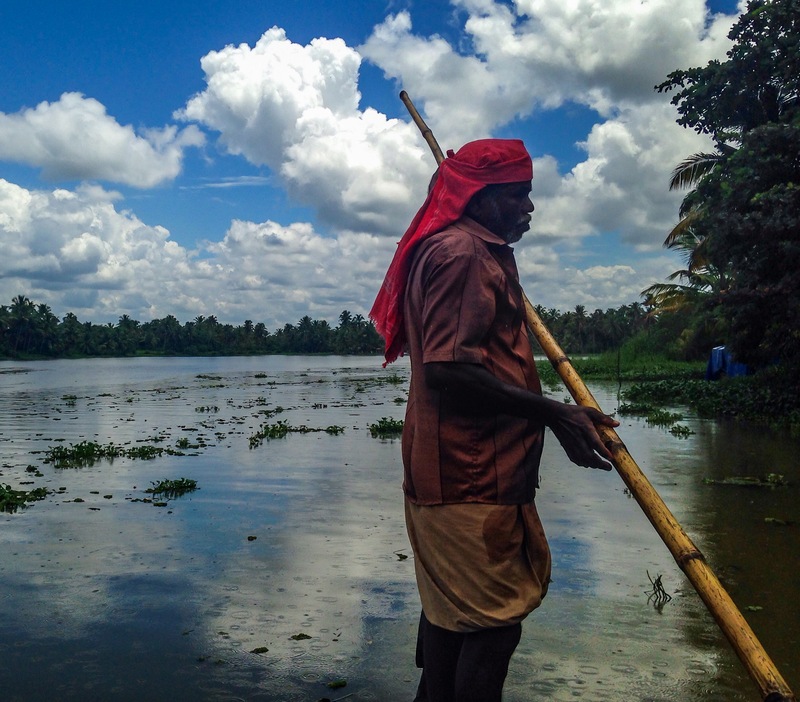 Once we entered the backwaters, the sounds were minimal: the slush of water slapping against the reeds of the boat, the call of a bird, the buzz of a fly, the rush of wind through grass. No wonder this region is called ‘God’s Own Country’. In a place as chaotic and noisy as India, even God needs somewhere to call Time Out. I would choose Kerala too. We spent a number of hours cruising the backwaters where we passed active fishing villages, sleepy hamlets and sheltered inlets. Men fished as women scrubbed laundry in the shallows; backbreaking work for each. Contrasting the slow laziness and ease of our journey, life for the locals is hard. Children splash gleefully in the cooling water, unaware of the existence that awaits them once their too-short childhood passes. I wonder how people here would enjoy our lives of laptops, busy bus commutes and stressful supermarkets. Would they miss the silence, the space, the simplicity? Once thing is certain, most of us could not live the lives they lead for long. I couldn’t help but recall one of my favourite quotations from ‘The Great Gatsby’ as we ventured deeper into the maze of backwaters. For lunch, we ate thali served on a banana leaf, as is tradition in Kerala. The food was delicious and plentiful, tangy with spices. Our hosts were warm and generous, as hosts always are in India. 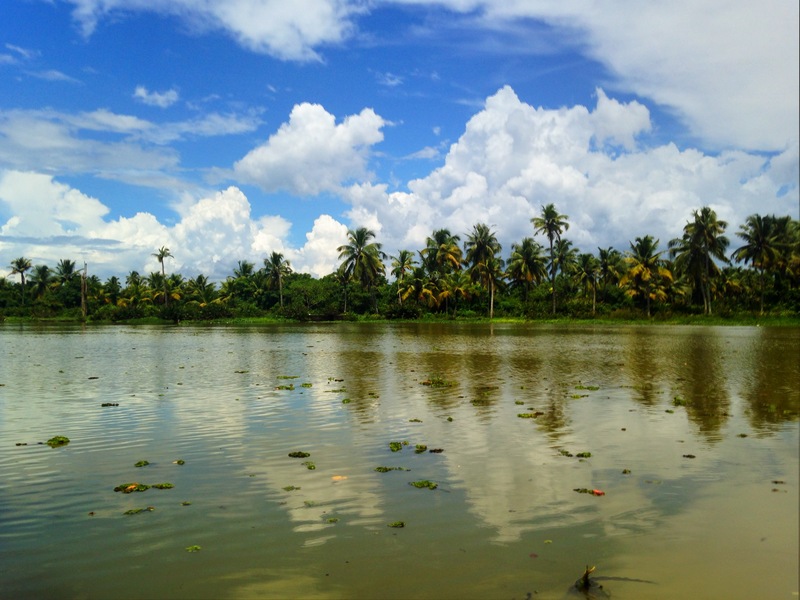 Although it is possible to spend a few days in the backwaters, we opted for a single day ride. It was enough for what we needed. I am a city girl after all and I missed the noise. Where is the quietest place you have ever visited? Do you like the buzz of the city or the solitude of the country best? Leave me a comment. This is such a good piece of writing 🙂 Kerala was already pretty high up on my travel hit list, but now I want to visit even sooner! I think I’d probably opt for the one day your myself. It sounds incredible cruising and getting a glimpse into people’s lives. I’m really interested in travel in India so will be checking out your other content. Thanks for a great post! Are you planning to visit India soon? It really is a unique country, there is nothing like it anywhere else, and I certainly think you learn a great deal about yourself when you travel in India! Love your narration and expression. It was a refreshing change reading about an experience rather than facts and information. Gorgeous photos! I do love the buzz of the city (I’ve been a city girl all my life and I don’t think I could ever life too far away from one) but I do need a bit of quiet time at the end of the day. You’re lucky you’re so used to noise, though! We had a massive thunderstorm the other day (I’ve seriously never experienced anything like this here in the UK), and it was so loud none of us slept all night. I would really struggle to live out in the countryside, but I do love to visit. Yeah, noise just isn’t an issue for me – I usually sleep through everything!! I love this post! It brings back really happy memories of time I spent in Kerala in 1997/98 and I’m so pleased to hear that it doesn’t seem to have changed too much. Thanks for sharing. I can’t imagine Kerala changing even in the next hundred years! I LOVE silence! Seriously, there is so much noise in our lives that the few moments I have utter silence is wonderful. I’ll have to check this place out. Yeah, I think that silence is seriously underrated, we have so much noise in our lives that many of us don’t know what to do when it’s quiet! I love the imagery with your words. I have to say that I never once found quiet on my month-long trip to India but I also didn’t go here. I think India is worthy of so many more visits and this places sounds like a place to add to that itinerary. Silence is definitely in short supply in India – even the Himalayas are noisy! Such a beautiful description of Kerala. I have to agree living in Korea for 2 years, my tolerance for noise has definitely gone up! This sounds like it’d be my favorite place visiting India, I definitely prefer the quieter areas to the more hectic ones. Ha ha! Yes, I can imagine that Korea is pretty noisy too! 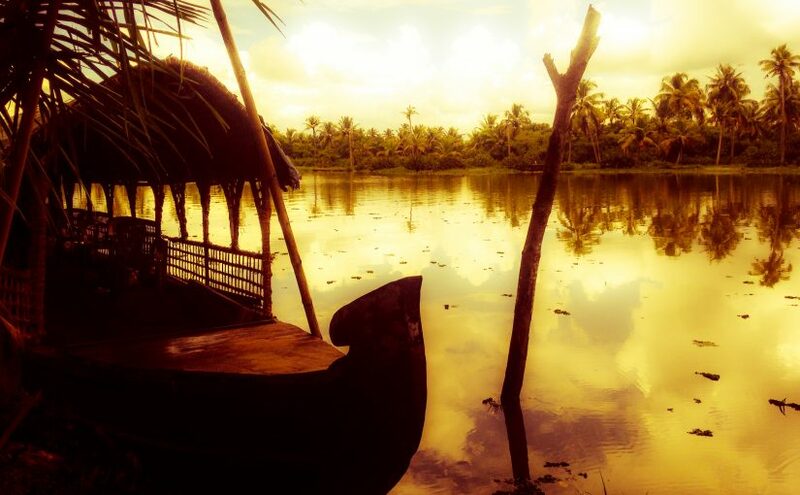 Kerala is a little patch of magic in a generally chaotic India. It’s really quite surprising how serene a backwaters cruise can be. It’s a perfect spot to escape and unwind while in India. It really is one of India’s gems, it’s so lovely.